This result is arguably the one that should have happened against Aston Villa a few weeks ago where only one goal was scored despite the dominance giving the opposition a chance to get back into the game. 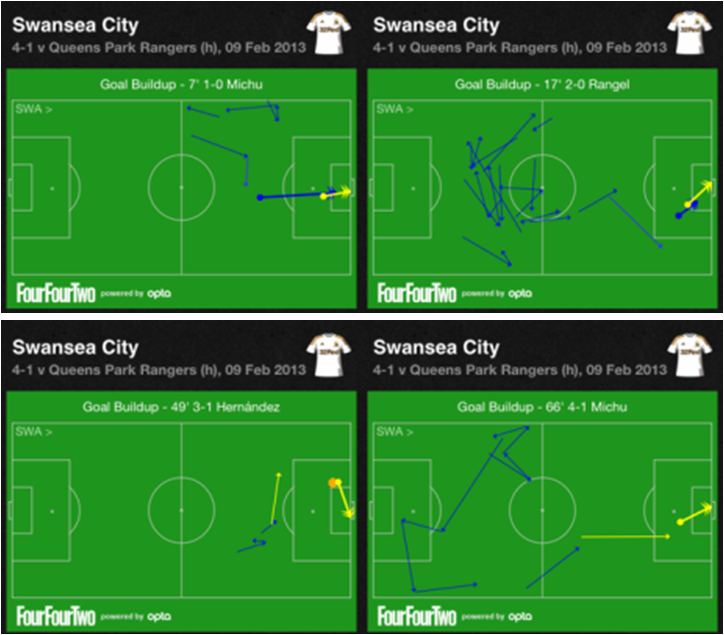 This was a far more clinical performance, even if there was an element of fortune in Michu's opener. With Leon not 100% fit, that probably encouraged Laudrup to return to playing all three of Dyer/Routledge/Pablo in what is an exciting and highly versatile attack behind Michu. It may not be as defensively solid as playing both Ki and Britton but a more attacking approach certainly paid off. The chalkboards for the 4 goals each have their merits and are good example of the inexact science of football stats, Routledge played a superb through ball to Rangel for the second, but as Rangel scored off the rebound and not the original shot, Routledge doesn't get the assist. Overall, QPR actually had more attempts than Swansea (18 compared to 15) but all 18 of QPR's came in the second half and 12 of them after the score was 4-1. It's never good to see a player get injured but given how much Chico has brought to the team this season it's particularly disappointing to see him stretchered off with only two weeks to Wembley. Before being injured, Chico had a 100% pass success rate from 31 passes. Biggest pass combination by some distance was Ben Davies to Pablo with 30 passes, the next highest combinations was Rangel to De Guzman with 18.